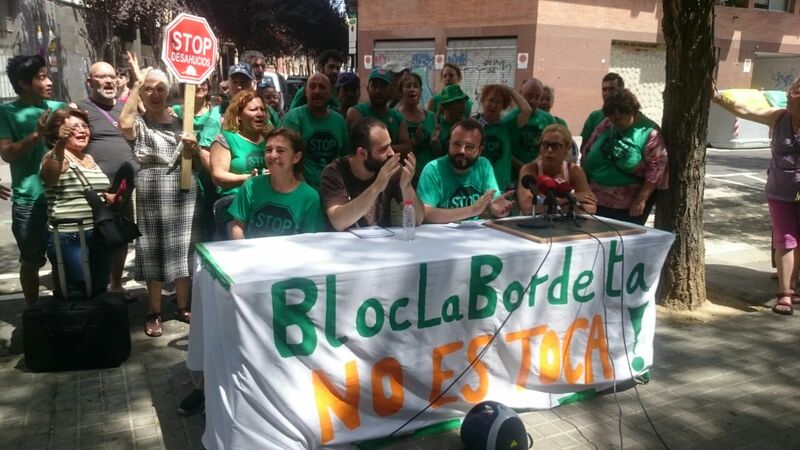 Press conference last Tuesday 7 July with PAH Obra Social’s spokesperson, PAH Barcelona spokesperson and two of BlocLaBordeta’s residents to denounce the precautionary eviction order and demand the eviction to be paralysed. Photo: Aida. Different levels of government have, so far, ineffectively responded to the systemic problems underlying the 500,000 rental and mortgage evictions across Spain during the past eight years of crisis. In this light, the PAH’s struggles for the right to decent and affordable housing for all are critical in materialising new political ecologies: that is, how our environment and social relations are (re)produced, who benefits and who is dispossessed. After the fall out of Spain’s housing boom, the BlocLaBordeta is one of 88,000 empty housing units in Barcelona, one of 3.5 million across Spain. Owned by a bankrupt real estate developer whose debt has been absorbed by Spain’s bad bank, the SAREB, it has sat empty for eight years – aside from being occupied twice and almost immediately evicted both times – awaiting a new cycle of speculation. By rupturing this cycle through recuperating the buildings for families with no housing alternative, and demanding social rent (30% of a family’s income) from the SAREB and the government in the otherwise abandoned flats, the PAH is forging new socio-ecological relations towards more just and egalitarian urban futures. The PAH is asking collectives and entities across Spain and beyond to sign the manifesto and show their support. To do so, send an email to lapahdebarcelona@gmail.com, with “adhesión-support” in the subject line. Please spread the word! Stay updated on Twitter through #BlocLaBordeta and #LaBordetaNoSeToca and by following PAH Barcelona and the PAH’s Obra Social campaign. From the Platform for Mortgage Affected People (PAH) in Barcelona, as we face an eviction order that threatens families currently living in the collectively recuperated housing block named Bloc La Bordeta, we want to make public the fact that we have pressed both the Barcelona City Council and the Catalan Government to intervene in the process. Both institutions have asked the judge not to order the eviction. On the other hand, we also urge the judiciary not to allow the families in the Bloc La Bordeta to be tossed on the street, as this violates the right to decent and adequate housing as enshrined in Article 47 of the Spanish constitution. We have also sent a memo requesting the collaboration of the Ombudsman, in an attempt to exhaust all the possible avenues for mediation to avoid the eviction. This past February we recovered an empty housing block for PAH Barcelona’s Obra Social campaign, the Bloc La Bordeta. Now there are nine adults and four children living in La Bordeta, all with no housing alternative. This housing, built by the construction company Nyala 2006 SL (a company owned by the Riera-Marsá family), has laid empty and unfinished for the past eight years. The company left the building without a water supply or a certificate of occupancy, and hasn’t paid the mortgage they took out for several years. Nyala 2006 SL’s debt is now being managed by the SAREB, Spain’s public-private “bad bank” whose goal is to profit from selling off real estate from the banks rescued after the country’s real estate bubble burst in 2008. But, today, despite the housing block laying empty for eight years, the construction company is still the owner. It is a housing block that in essence has been financed with public funds to cover the debt of a private company. The SAREB has dismissed becoming the owner of the property, surely to evade its responsibility in the face of citizens who have for years been demanding social rental housing that include the flats left in its hands. In order to not negotiate with the families of the PAH, the SAREB alleges that the construction company owns the building, also avoiding getting its hands dirty in the judicial process. Nyala 2006, i.e. the Riera-Marsá family, refuses to even talk with the PAH to find a solution, instead betting on leaving families on the street and not caring about these consequences in the least. In the judicial process that began after the request for a precautionary eviction, the judge has ruled in favour of the builder and has ordered the eviction of the housing block, giving families seven days to leave voluntarily after the injunction arrives, which as of today has not been received. This judge ignores the sentence of the European Court of Human Rights which states that there can be no eviction without adequate resettlement. We will not allow this to happen, because these families would literally be left on the street. 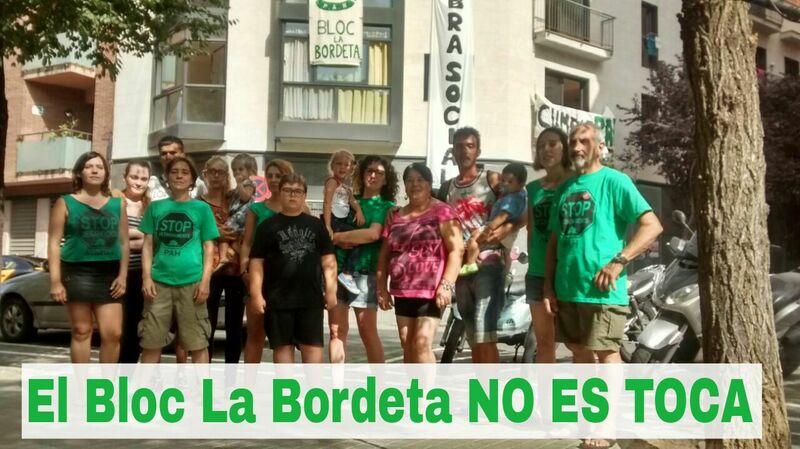 We are making a call out to defend the Bloc la Bordeta, for people to position themselves for the right to housing.